Today's photo is a shot of one of the more noted buildings in uptown Butte: the old Curtis Music Hall. It's the home of Gamer's Cafe, which is just another mediocre little restaurant these days ... but was once something really special. With its spectacular scenery and old-west feel, Montana has been a popular shooting location for feature films since at least the 1920s, and over the years many dozens of Hollywood productions have been at least partially filmed in the state. Only a few of them actually have the word "Montana" in the title, though, and here's the poster for the best-known of those. 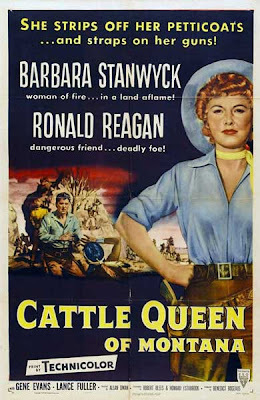 Cattle Queen of Montana is a 1954 movie partly filmed near the eastern boundary of Glacier Park, in the St. Mary and East Glacier areas. The film starred the great Barbara Stanwyck, whose most iconic western role came a decade later in the television series The Big Valley. The movie's other lead was some guy who I think later went into politics, or something ... who knows. I shall not comment on the description below his name in the film poster. Back in the late 1970s an enterprising gentleman named Mike Dalton created a series of thin paperback books designed mainly for sale in Montana -- the North Dakota Joke Books. They were sold at diners and truck stops and souvenir stands, and quickly became part of the Montana popular culture. They've been out of print for ages, and are minor collectors items today. The jokes themselves were pretty silly ... mostly, recycled ones that you'd heard a thousand times before but with different place names. But as anyone who's seen the movie Fargo knows, its extremely easy and entertaining to make fun of a North Dakotan. Today's quote is a sample from one of the joke books, and you might see some others later. There was a North Dakotan who lived right on the Montana border. One day some surveyors came to his door to inform him that they had made a mistake years before and now the North Dakotans actually lived in Montana. "Oh, good," said the North Dakotan. "I don't think I could stand another one of those North Dakota winters." I mentioned a few days ago that I was a fan of the "Electric Highway," which was the name of an east-west route across Montana back in the 1920s. Though the name is long gone, the route exists today as a part of US Highway 12, and it's still one of my preferred routes across the state. Here's a shot I took a few years ago of the loneliest part of the Electric Highway, in the desolate landscape of northwestern Rosebud County. You can drive for miles without seeing another car out there, and on this trip I had plenty of time to park in the middle of the road, compose and shoot a long series of photos, and even answer nature's call, without worrying in the least that a passing vehicle might show up to spoil one of my shots. If all goes as planned, the final segment of the Going-to-the-Sun Road across Glacier Park will open to the public for the season today. This year's opening is a couple of weeks later than usual, due in part to roadwork on the road's upper reaches ... but it's also pretty evident that the Park Service is less dedicated to maintaining public access to the road these days. Anyhow, here's a photo I took near Logan Pass in late May 2005, back when the Park was more enthusiastic about a timely road opening. That's Mt. Reynolds in the background. There are a zillion Montana guidebooks on the market these days, the vast majority of them very hard to recommend. I've mentioned before that I don't feel that way about the old WPA guide to Montana ... despite the fact that the data is more than 70 years old, I still think it's the best state guidebook out there. It's a volume filled with great anecdotes and really wonderful descriptions -- and not just of the main tourist sites, but of the usually-overlooked places, as well. Here's a representative paragraph from the tour section of the book, this one describing a stretch of old US 10 west of Hysham. The road is still out there, but it was long since bypassed by an I-94 routing several miles away. The landowner has fenced the area off, so now there's no one to appreciate the setting that the guidebook so evocatively described. US 10 now winds through lonely badlands. Under an uncompromising sun the sides of the buttes are mottled with brown, buff, and gray. After sundown, as twilight shades into dusk, the masses of guttered rock take on eerie tones of purple and black. Only the bark and scurry of prairie dogs by day, and the dismal howl of coyotes by night, indicate the presence of living things. 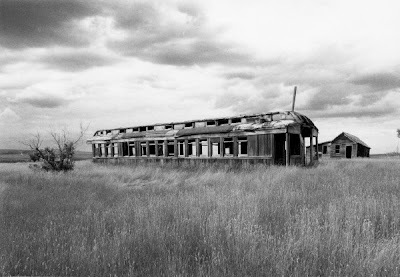 I photographed this abandoned railroad car years ago in the long-deserted village of Comertown, way out in Sheridan County. Just a stone's throw from both North Dakota and Saskatchewan, Comertown was once a booming homestead community on the Soo Line Railroad's old Whitetail branch ... it was as far west as that railway ever got. The tracks still run past the edge of town, but the people have all disappeared. The city of Anaconda is an interesting place, and kind of a sad one. For decades it was the booming home of the Anaconda Copper Company's massive smelter, processing trainloads of ore shipped in from the mines of Butte. But the smelter closed almost three decades ago, and the town has been fading and withering ever since. But still, the place has an interesting collection of sights, including some great old bars, perhaps the best golf course in Montana, and one of the finest Art Deco movie theatres in the nation. And it has "The Stack." 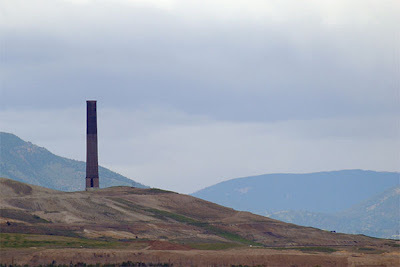 Almost all that's left of the old smelter, this huge brick smokestack is some 585 feet tall and is visible for miles -- looking over one of the largest Superfund sites in the nation, an environmental tragedy that it helped create. This morning's quote is one that many of you will remember -- it's a bit of dialogue from the 1990 film, The Hunt for Red October. The conversation is between two Soviet naval officers, heading to America in a nuclear submarine and hoping to defect. Borodin: Do you think they will let me live in Montana? Ramius: I would think they'll let you live wherever you want. Borodin: Good. Then I will live in Montana. And I will marry a round American woman and raise rabbits, and she will cook them for me. And I will have a pickup truck... maybe even a "recreational vehicle." And drive from state to state. Do they let you do that? Ramius: No papers, state to state. Borodin: Well then, in winter I will live in . . . Arizona. Actually, I think I will need two wives. Borodin: I would like to have seen Montana. I'm not sure what people would think a "typical Montana scene" is today ... the mountains, perhaps, or a ski hill, or maybe the Unibomber's cabin. But here's an early twentieth-century postcard with an interpretation that I really like. There's no indication of where this was taken, at all -- somewhere in he southeast part of the state, I'd guess. But the photo has lots of great detail (some of it perhaps drawn in), and the hand-tinting of the scene is pretty cool. Yesterday's post mentioned Bozeman's news story of the year -- the explosion last March that destroyed half a block of Main Street businesses. The explosion was apparently caused by a natural gas leak coming from a broken pipeline in the alley. 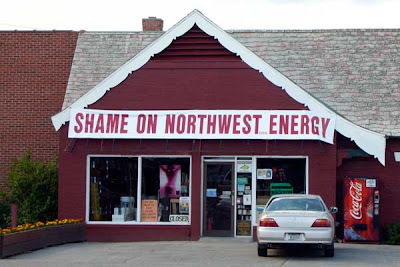 The pipeline was owned by Northwestern Energy, the state's major public utility, and the incident has cast a very unwanted spotlight on them over the past few months. A couple of decades ago, the state's utility provider was Montana Power, a local company with a network of mostly hydroelectric plants that provided power cheaply and efficiently. And then two things happened: the state decided that free enterprise should be king, and deregulated the company; and Montana Power got greedy, and bet the farm on a speculative expansion into high tech. Not long after that, of course, everything collapsed in a spectacular fashion. Soon the company was bankrupt, and investigative reporters from 60 Minutes were chasing its executives through the back alleys of Butte. 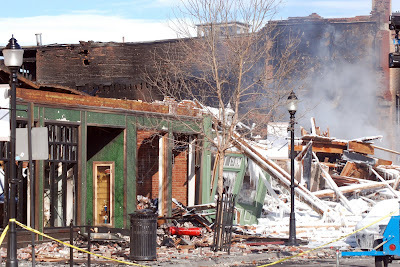 Here's a photo I took of one of Montana's more dramatic events in 2009: the explosion and fire that destroyed half a block of downtown Bozeman last March. The blast killed a person, destroyed four lovely old historic buildings, and traumatized the community in a way that few events have. This photo shows the remains of the infamous Rocking R Bar, which had been a second home to generations of Bozeman college students. Two days after the explosion, and the ruins are still smoldering. More on this in tomorrow's post. Butte, a dismal town, was once the roughest and the brightest of the western mining camps. Until a few years ago gambling was legal there, and there was a famous "prostitutes' line" ("Just over there," an Anaconda official remarked to me nostalgically, "you could almost see it from my window.") Now all is drab and dingy, and the few nightclubs, ablaze with tawdry light, are outside the town in a dreary little hamlet among the hills. You can still hear many different languages in the bard of Butte, and on the town boundary there is an official sign which says of the place: "She was a bold, unashamed, rootin', tootin', hell-roarin' camp in days gone by and still drinks her liquor straight." But there is an endless dull slovenliness about the town that is greatly depressing, and frequently you can see cracks in the streets, and green grass growing, and the signs of movement and stress that show a mine shaft is beneath. 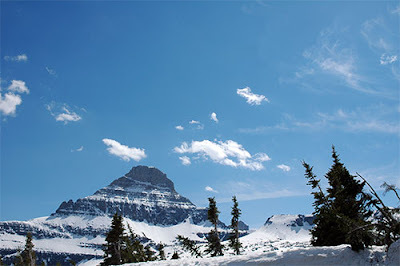 Montana's most famous and lovely mountains, of course, are in Glacier Park ... but that doesn't mean there's a shortage of spectacular topography elsewhere in the state. I took this shot last summer at the "Snowline" exit of Interstate 15, down in Beaverhead County. We're looking southwest into the Beaverhead Mountains, a little-visited and almost roadless region. Some of the ridgeline you see marks both the Continental Divide and the Montana-Idaho state line. I'm a big fan of old postcards ... not only can they be very evocative, but they're also a fine source of historic photographs that are seldom found anywhere else. 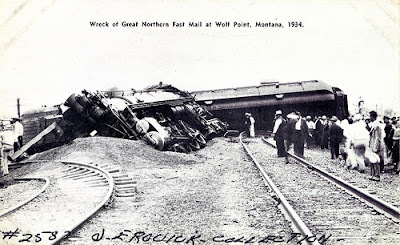 Here's one from the Smithsonian Institution's postcard collection, showing the derailment of the Great Northern Railway's Fast Mail train near Wolf Point, back in August 1934. The Fast Mail's engineer was killed in the wreck, which took place when the train hit an automobile that had gotten stalled on the tracks. The locomotive fireman was badly scalded during the accident, but only one of the ten passengers was slightly injured. It's the kind of country where men are expected to walk tall. I just said I was English and slunk around as I usually do. Hiking the Gunsight Pass trail in Glacier National Park, some of the best views are a couple miles west of the pass, where the trail angles along the south slope of Lincoln Peak. Head off the trail just a little ways, and suddenly you're at the edge of a cliff, thousands of feet above Lincoln Lake. I think it's one of the most spectacular spots on earth. I took this picture ages ago, while working as a summer employee in Glacier. Lake Ellen Wilson is on the left, with Lincoln Lake far below on the right. The guy sitting on the cliff was a co-worker of mine who went by the nickname "Hooch"; he is, of course, wearing the requisite "Go Climb a Glacier" T-shirt. "I shouldn’t have been surprised that Rapelje was just exactly like a thousand other dying towns on the Northern Plains: a mostly-empty grid of dirt streets with a few houses scattered here and there; a couple of long-abandoned business buildings and a prefab metal structure housing a tiny cafe; an 85-year-old schoolhouse; and a small horde of vehicles parked in front of a little white church hosting Sunday services. 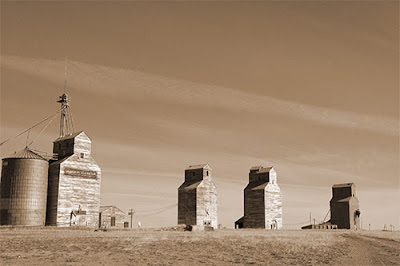 Easily the ﬁnest sight in town was a row of old wooden grain elevators lined up beside an abandoned railway grade ... so I pulled the car oﬀ into the weeds, let the dog out, and took some pictures." Highway 24 is a patchy stretch of asphalt through choppy buttes and valleys ... there are few trees, not even much sage. In the fifty-nine miles between Fort Peck and Highway 200 I see seven cars, two ranch houses, and an unending string of barbed wire near both shoulders. 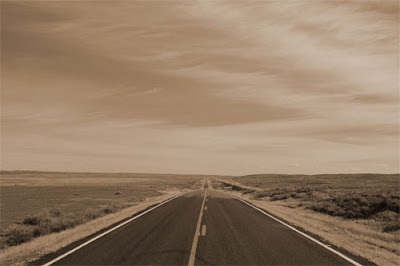 Twenty-five miles north of Highway 200 [the truck] loses radio contact with the world again. I switch to the tape cassette. 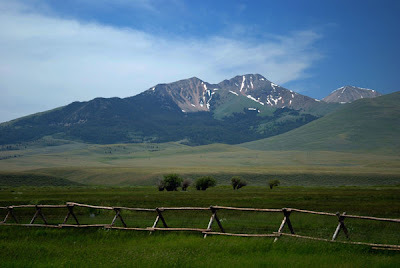 Merle Haggard sings, "Turn me loose, set me free, somewhere in the middle of Montana . . . Big city, turn me loose and set me free." Today marks another railroad anniversary with strong Montana connections. Eighty years ago today, the Great Northern Railway's Empire Builder passenger train began its first trips between Chicago and Seattle. 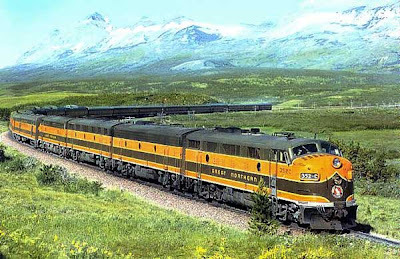 Named for James J. Hill, the man who created the Great Northern, the Empire Builder has served the residents of northern Montana ever since. And though I think the Olympian Hiawatha was probably Montana's most beautiful passenger train, there's no doubt that the Builder was the state's premier service. Today it remains the premier long-distance train on the Amtrak network, and is the most-ridden passenger train in the country. This morning's photo is an old railroad publicity shot of the eastbound train, taken in about 1957 near East Glacier Park. The Empire Builder was at its peak then, with two kinds of dome cars, a round-end observation, and a handsome orange-and-green paint scheme. I've promised lots of road photos in this blog, and here's an historic one. This is from 1936, and is looking east at the junction of old US Highway 10 and what is now Montana 41. I know at least one of you has a particular interest in that part of the world. 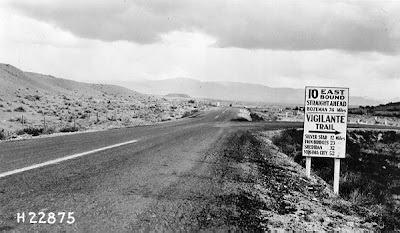 Notice how the sign still labels route 41 as the "Vigilante Trail." That's a reminder of earlier days when highways were given names, rather than numbers ... a tradition that started dying out in the 1920s and was nearly gone when this photo was taken. There were once a number of well-known named highways in Montana -- much of old US 10, for example, was called the "Yellowstone Trail." My favorite named road in the state was the "Electric Highway," which followed the route of the current US 12 ... it was so named because of the electric locomotives used by the Milwaukee Road, whose main line paralleled the highway. 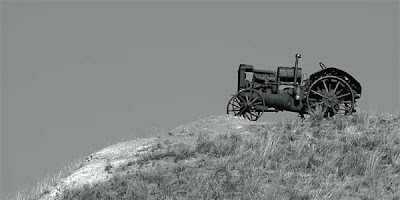 Those of you who travel Interstate 90 across southwestern Montana might have seen this vintage farm tractor before ... it sits on a hilltop overlooking the freeway a few miles east of Whitehall. Here's a photo I took a couple of months ago of downtown Two Dot, Montana. 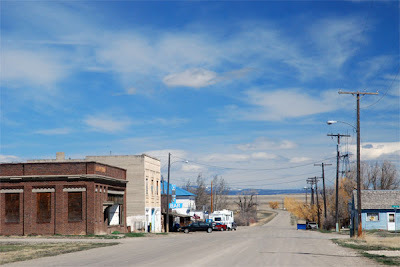 It's got all the quintessential features of a fading western farm town -- a long-abandoned bank building, an ancient and inviting dive bar, a little post office, and not much else. And the bar is for sale, if anyone's interested! I've always liked Two Dot ... partly because of the name, I suppose. The town is also the subject of a Hank Williams, Jr. song, but I won't hold that against the place. We left Whitefish and drove through the afternoon, seeing no one in the last hour and a half except moose, deer, elk, and grouse, all running across the road in great numbers. White daisies lined the one-lane dirt road. . . .
We kept driving, climbing, and then we came down off the summit and into the little blue valley. 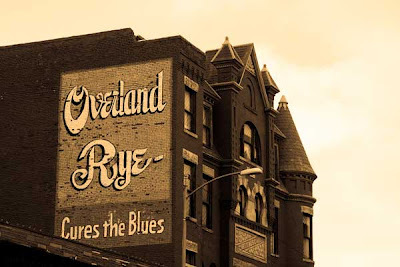 There was nothing but a mercantile and a saloon, one building on either side of the street, and a slow winding river working through the valley (a cow moose and her calf standing in the river behind the mercantile) -- and still no sign of life, no people. It was as if they had all been massacred, I thought happily. We knew immediately that this was where we wanted to live, where we had always wanted to live. We had never felt such magic. I know that sunset photos are cliché, but I still love taking them. 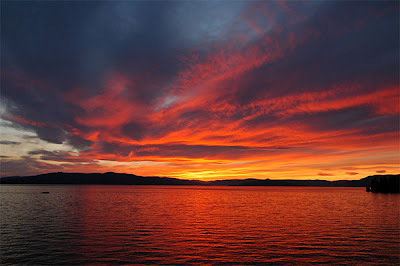 Here's a fairly amazing sunset that I saw in 2006 while driving down the east side of Flathead Lake. 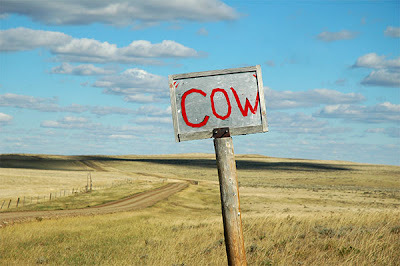 Of all the signs in Montana, I think this one might be my very favorite. I photographed it in 2006 on the dirt road that heads due west from Alzada, into some extremely lovely country that's truly in the middle of nowhere. So a few days ago I posted a quote which implied that Montana's graveyards weren't big enough, and I mentioned that I hadn't been able to find as much out about it as I would have liked. Well, my friend Greg inspired me to keep researching, and here's what I found out. I'd read the quote in the Montana chapter of John Gunther's wonderful old book, Inside U.S.A., which remains one of the best studies of 20th-Century America ever written. But Gunther wasn't much into citations and footnotes, so it took some digging to find the original quote ... and when I did, I discovered that Gunther was a little sloppy in his attribution. "Montana's real trouble," said an old rancher to me, "is that her graveyards aren't big enough." He explained that he was not advocating a general resort to the hangings of vigilante days, nor even waiting until a new generation came on the scene, but that more Montanans must come to look upon the State as their permanent home and final resting place. 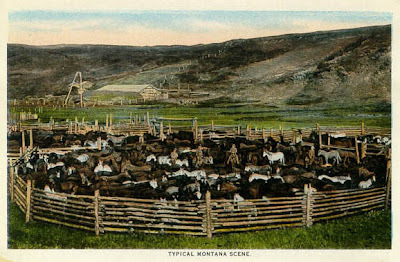 From the first pioneers who washed their fortunes out of the gold placers, with hydraulic pressure turning pleasant hillsides into desolate wastes of boulders, nearly all who have come to Montana have looked forward to the day when they would have accumulated sufficient funds to permit them to live out the remainder of their days in southern California, Florida, or New York. It's interesting how things have changed since 1923. Nowadays, people make their money elsewhere, and when they accumulate sufficient funds they move to Montana to live out the remainder of their days! Since I'm headed up to Great Falls again this morning, I thought I'd post a photo I took in the Electric City a few weeks ago. 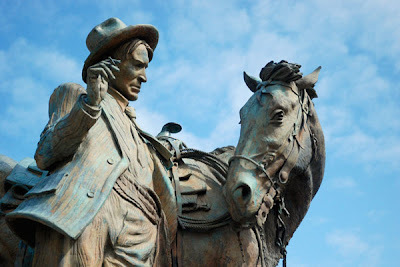 This is the downtown statue of the famous cowboy artist Charles M. Russell and his horse Monte ... Charlie is the one on the left. I haven't posted a photo of my own town of Bozeman yet, and this one seems as reflective of the community as any. 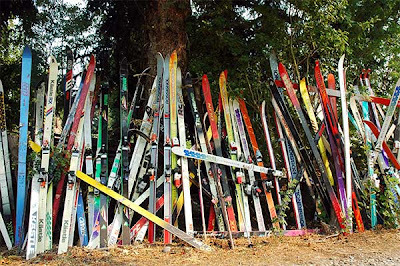 This collection of discarded skis marks the property line of a small home on the town's north side. 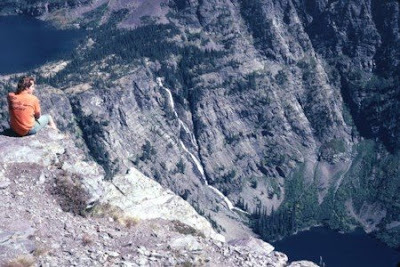 Back in the 1930s the Montana State Highway Commission employed an engineer named Robert Fletcher, a man who also dabbled in western writing and poetry. He wrote history books, historic markers for the Montana roadsides ... and the poem reproduced below, which he sold to Cole Porter in 1934 for $250. Porter changed a few words around, added it to a movie soundtrack, and the rest is history.